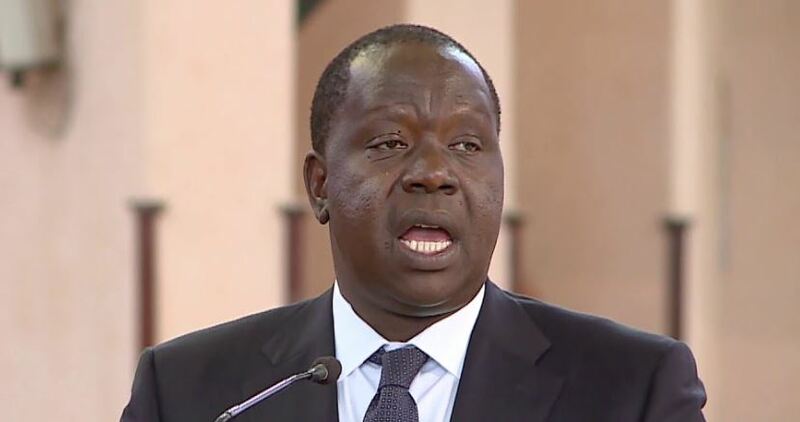 Interior CS Fred Matiang’i has emerged as an unlikely candidate for the Presidential contest as premature 2022 succession politics heat up. Nakuru West MP Samuel Arama has endorsed the former Education CS as a likely successor to President Uhuru Kenyatta. The legislator observed that it’s high time Kenya moved from having Presidents drawn from only two communities. “We need a break from Kikuyu, Kalenjin presidents. Is it fair for a country of 43 tribes to be led in all of its history by sons hailing from only two communities?” Arama posed. Arama noted that the Kisii community has several political leaders who can lead the country. “Matiang’i has shown that he has qualities to be the next President of Kenya. I will push my community to have him on the ballot to show the other communities that this seat is not their preserve,” he said. According to Arama, some leaders from the “dominant” communities are making others feel like clinching the presidency is an uphill task that can only be achieved by one of their own. “Other tribes are talking so passionately about the succession politics and the fronted flag bearers as if these other communities do not exist. This is very retrogressive and selfish thinking,” blasted Arama. “If Kenyans elect Ruto, well and good, and if they reject him there is nothing wrong with that. That is democracy. Even someone from another tribe contesting and winning a governor’s seat in Nakuru is hard,” Arama said. The MP spoke on Monday when he issued bursary cheques worth Sh4.1 million to more than 200 needy students from his constituency.